I should have known you can’t have just one book about dead bishops. Here is another one, although the bishop isn’t the main character, or anything. This is a Halloween book, so go get a copy to get you into a nice demonish mood for the day. It can be very dangerous for the TBR pile development to go and poke around on other people’s blogs, but when Declan on Crime Always Pays put the first chapter of John Connolly’s The Gates up, I couldn’t resist. And John was extremely charming about being begged for a copy. The Gates is a very funny book, and very exciting, too. (And what’s more, it’s short, in this age of four-inch thick books.) Samuel Johnson and his dachshund Boswell are out trick-or-treating, slightly prematurely, when they come across something at the neighbours’ house that doesn’t look very good. It’s not good. Earth is about to be invaded by really bad demons. (But as the more alert readers can work out, Halloween is not a good time for demons to invade anywhere.) 11-year-old Samuel and his friends and his dog have to try and save the world from this new threat. They get some assistance from a friendly demon called Nurd, and information – if not useful help – from the scientists involved with the Large Hadron Collider. Because it just happens to accidentally help the demons find a way in. John believes in footnotes. Lots of them. They are very amusing footnotes, which is lucky, because I really don’t like the flow of my reading interrupted all the time. But I forgive him, because they are funny. And necessary. As with far too many authors, I don’t know John’s books at all. In the case of The Gates, think Douglas Adams meets Eoin Colfer. That should do it. Oh, Witch Baby, how lovely and normal you are! First and foremost you are a sweet little toddler. I know you just happen to be able to do magic, because you’re a witch, and you’re getting really good at it now. As with all toddlers, you are slowly learning to interact with friends and family, too. And you love that dog of yours. So when WayWoof disappears, we can just about guess why. After all, there are puppies on the way, somehow. And you just have to find your WayWoof again. 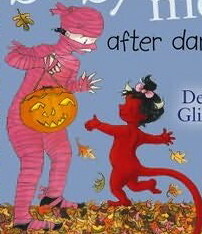 It being Halloween, you go round the neighbourhood with big sister Lily and her friend Vivaldi. Never mind that they are trussed up in sheets like mummies. Your costume is marvellous, and very convincing. All of them are. I think I like the little devil one is best. Everyone seems to be out for Halloween, including the Chin. I think you’re proving to be a good influence on both the Chin and the Toad. Possibly even on the Nose. Love is beautiful for witches and lonely Daddies and imaginary werewolves. This grumpy old witch thinks that everyone should read about you, Witch Baby. And your kind of puppy is the best kind. Hmm, Perfect Peter may have been emptying the dishwasher unasked, which is rather wet, but perhaps there is more to him than that. Horrid Henry is as ‘horrid’ as ever, and uses ‘poor’ Perfect Peter for his own needs, in this almost Halloweeny Horrid Henry Wakes the Dead. You have to give it to Henry, he does have some good and original ideas, when all his peers are somewhat useless, not to mention untalented. ‘Waking the dead’ as entertainment is not your average school show material. And not every school invites TV presenters like Sneering Simone. Wonder where Francesca got the inspiration for him? Four more stories about our HH, with friends and family. When will Fantastic Francesca run out of alliteration on the names front? Hope you people aren’t getting tired of this Halloween review week, btw? More excellent spooky books here before the week is safely over. I’ll be done when Plucky Palmer’s pumpkin explodes on Saturday evening. I would insist on a black cat with a white paw if I were to have a cat. And by the end of this adorable picture book, Trixie has come to the conclusion that being different is good. Have you ever stopped to think about a roomful of identical black cats? Hard for a witch to find hers in a hurry. Trixie’s witch looks rather like me; what you can see of her. A witch with a bicycle bell on her broomstick is a sensible witch. This book spoke to me. Wonder why that could be? 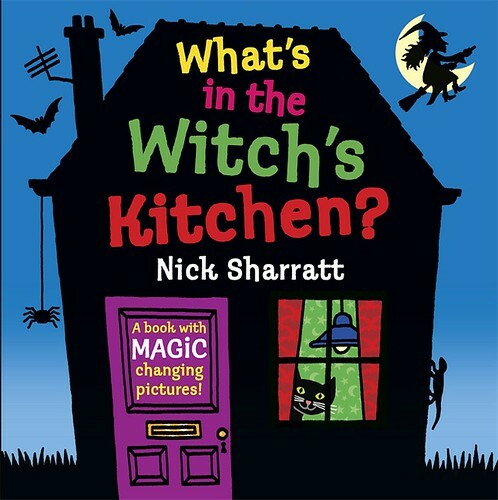 Nick Sharratt has a book, all by himself, called What’s in the Witch’s Kitchen?, and it’s got that nice, slightly creepy, Halloweeny feel to it. My kitchen, on the other hand, is nothing like it. I would quite like a purple lino tiled floor, though, and the purple dresser’s nice, too. It’s a flappy book, this witch kitchen picture book, with a final pop-out. You can look in the witch’s fridge, dresser, oven, and so on, in two different ways. One is nice and normal, and the other is a little less pleasant. Someone should tell the witch about basic kitchen hygiene, and what doesn’t belong in a kitchen. I tried to work out if there’s a pattern to which flap will yield the less lovely revelation, but lost myself hopelessly after a while. You open up and down, left and right. And to finish someone pops out. Is it you? Well, that could make me cry. Almost, anyway. Happy tears, you understand. As the witch started negotiations with the Manchester Literature Festival people about an interview slot with Michelle Magorian, it felt like a good idea to say that Michelle might remember me from last year’s launch of Just Henry. I was told she did, but people can be polite, you know. So, when we met in the Imperial War Museum’s café for our chat on Sunday afternoon, the first thing Michelle does is rummage in her bag, saying she’s got something for me. Nice, but what? I’ll tell you what. Only a lovingly signed copy of Just Henry in Swedish, which is just out. We did talk of translations last year. We did. But it was in a room full of people at a busy launch, and I was a complete stranger. What a memory! 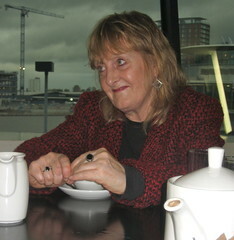 Anyway, once we had been supplied with cups of tea, we got going with the interview. Not that Michelle felt there was anything interesting that she could tell me. The Resident IT Consultant attended, armed with a camera, since Daughter had taken herself and her camera off for half term. As a matter of fact, he didn’t do too badly at his first interview. Michelle’s son George wandered off to look at the museum, while our twenty minutes somehow ended up being 45 (sorry, Alistair!). So we obviously must have found something to talk about. Afterwards it was time for Michelle’s event, as the crowning glory of this year’s Literature Festival. They closed the museum, and us fans settled down in the main exhibition hall. As an author talk it rates as one of the best. Well delivered, as you’d expect from an actress, and very well chosen selection of readings from several of her books, with anecdotes in-between. 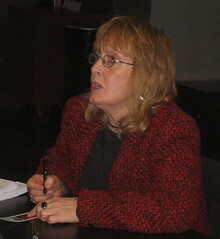 Michelle provided an interesting thread between all her stories, and the readings benefitted from a variety of accents. Good questions from the audience, with interesting answers. And I love a woman who can admit to waiting with her career, because she wants to spend time with her sons, even when they are as old as Michelle’s two. But with some luck, we’ll have a new Magorian novel some time next year. Yay! Yesterday I breakfasted with my laptop. Whatever you may believe about me, I don’t usually. And it’s not because Daughter has gone to Uppsala. Normally the Resident IT Consultant would already be up, supplying the kitchen with the Saturday paper. But he slept late. I like reading with my breakfast, at the kitchen table. As you well know, I have lots to read, but at the table I want to be hands-free, so read the paper, any magazines I have, catalogues, leaflets, pamphlets (they might be the same, for all I know), press releases for books. Anything. Because I’m so busy, I tend to build up a supply of vaguely out-of-date magazines, which means there is always something to grab. I suppose I’ll have to go round some dentists’ waiting rooms and steal their old magazines, or it’ll be blogs and Facebook with meals in the future.